Crab Feasts are a great way to raise substantial money for your organization while providing a bonding opportunity for members. This may be a major event for your organization so naturally you would like it to be great. You want to hire a reputable seafood company with years of experience. All crab feasts are directly done through the President/Owner of She’s Got Crabs, LLC. We will be able to help your organization in the right direction to make sure that your guests enjoy high quality crabs and in turn you make a profit. Once your organization has decided to do a crab feast, you would want to set up an appointment with the owner to discuss your event and the venue at which it is being held. We will then discuss whether you would like the crabs to be cooked on site or brought in from our retail outlet. Rest assure when using She’s Got Crabs for your function, you will only get the freshest crabs around. We have NEVER pre-cooked crabs and never will. We only sell hard crabs, packed with meat! When you order large crabs, you GET large crabs. We will need to decide what you would like the ticket price to be, in order to determine what size and how many bushels of crabs will be needed to take care of everyone at your event. Please keep in mind that the size of your feast, the time of year, the size and the amount of crabs will help all be factors in the final price. 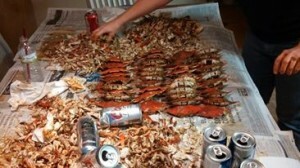 We supply feasts with anywhere from 5-100 bushels of crabs. For larger feasts, we are happy to supply paper and mallets free of charge. She’s Got Crabs only cooks the amount of crabs needed at the event. So if you think you need 60 bushels but only end up needing 55 bushels, you only get charged for the 55. This will ensure that you don’t end up wasting your profit or crabs. Whether you have had feasts in the past and are looking for a BEST price with the highest quality or you are thinking about doing one for the first time and need some planning advice please give me a call! We buy directly off the boat crabs so you are Guaranteed the BEST PRICE around.